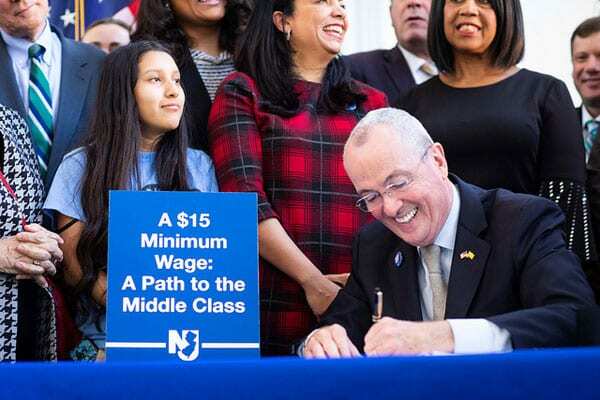 On Monday, New Jersey became the fourth state to raise its hourly minimum wage by a significant amount and commit to a $15 minimum wage in the next few years. The New Jersey Working Families Alliance (NJWFA), New Jersey Education Association, racial justice organizers, clergy members, and others ran a smart movement that achieved this major goal, though advocates say there is plenty more work to be done. Officially, the wage for most workers will increase to $10 per hour starting July 1st of this year, then increase by $1 an hour every January 1st until 2024, when it will hit $15. After that, minimum wage increases will be indexed to inflation. Agricultural, seasonal, and tipped workers are the notable exceptions. Their wage increases will come later, and they aren’t guaranteed to reach the full $15 hourly minimum. Northjersey.com helpfully reprinted a chart from the Assembly Majority Office showing the different wages and increases over the next few years. NJWFA has been working on this campaign for years. They almost succeeded a few years ago, but then-governor Chris Christie vetoed the bill, saying that it was too much, too fast, and would hurt small businesses and, ultimately, workers—a common argument by opponents that is contested among economists. (We might argue that if your business model depends upon underpaying your staff, then perhaps it is not as workable as it appears.) NPQ has been following the Fight for $15, an intersectional movement that could improve the lives of women, immigrants, people of color, and other groups that tend to be overrepresented in underpaid jobs. NJWFA did not give up after Christie’s veto; they moved down a rung of government to where they could find success. Like states that began passing protective laws in the absence of federal leadership, cities and counties began to raise the minimum wage of their workers to set an example for the state. The exclusion of farmworkers from basic labor standards is, unfortunately, nothing new in the United States. When the right to unionize was codified under the Federal National Labor Relations Act (NLRA), farmworkers were excluded to win over the votes of Southern Democrats—who did not believe that the right to organize should be extended to migrant farmworkers and black sharecroppers. Legal Services of New Jersey, a nonprofit that provides legal assistance and resources to those who are unable to pay, clarified that “farmworkers in New Jersey have the right to join together to organize, discuss as a group, and bargain with their employer about wage rates and conditions of work.” However, many advocates are still fighting for basic labor protections such as overtime pay. While the poverty rate of non-tipped workers is 6.5 percent, tipped workers have a poverty rate of 12.8 percent. Tipped workers are thus nearly twice as likely to live in poverty as are non-tipped workers. Yet poverty rates are significantly lower for tipped workers in states where they receive the full regular minimum wage.